Nigerians are not convinced after the West Africa Examination Council issued President Muhammadu Buhari a school certificate on Friday. The handing over was done by Dr Iyi Uwadiae, the Registrar of WAEC. The news was shared on Twitter by Femi Adesina, Buhari’s Special Adviser on Media and Publicity. 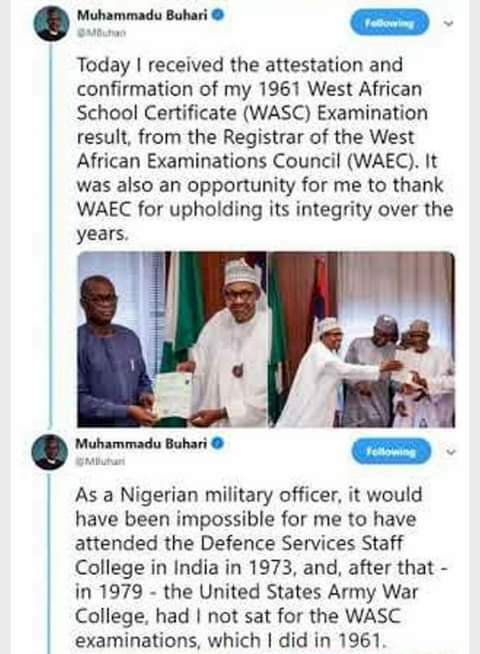 As photos of the certificate presentation at the State House emerged, Nigerians have been reacting to the news, demanding to know why he is just collecting his certificate from WAEC, after he had presented a sworn affidavit to the Independent National Electoral Commission, claiming that his certificate was with the military. WAEC issues certificate ONLY ONCE irrespective of who you are. Baba Buhari, where is your certificate? Let's scrutinize the passport on it you'll notice that it's impossible for him to look that old when he wrote his WAEC. This is the height of fraud..
Oh shame! Disgrace! Nigeria, Nigerians, your 86 year president, Buhari, claims he's just receiving WAEC attestation today? What a pitiful, pitiable country you are! Little wonder Nigeria is the poverty capital of the world! Poverty of the mind is the worst form of poverty! so you can actually get an attestation and a confirmation of cert from WAEC. Typical Baba go slow. It took you 4 years. Either you guys are lying or WAEC is in competently slow. BTW will it cost you N1 if you post a snapshot of the documents here? I have always known you were silly, but certainly not to this extent. Did you expect Nigerians sit back and fold their arms while their politicians lacked the basic requirement to contest an election? Tueh! Thomas also asked for the hand of Jesus after his resurrection from the cross. Jesus showed him, then he believed. Sit down and wail while you expect when Buhari will present his WAEC attestation and confirmation to INEC. After donkey years? Attestation and confirmation certificate? Lol? 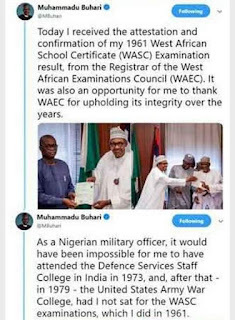 Where is the original certificate issued to Buhari, if he EVER sat for WAEC exams? After hiring 13 SAN to defend it in court abi? Una tink say we by mumu abi? Exactly. But my Question is this, would you hire someone to work in the villa because he told you his Certificate is with the School or in his Father's grave? Or are you in the villa with affidavits too?